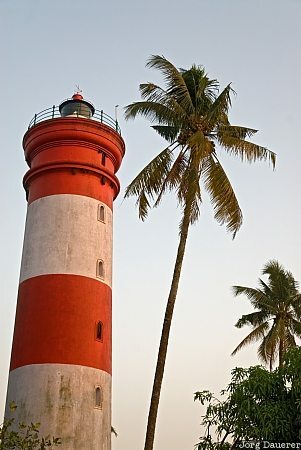 A palm tree and the red a white Alleppey Lighthouse at the Arabian Sea illuminated by warm evening light. Alleppey is in the western part of Kerala in southern India. This photo was taken in the evening of a humid day in February of 2011. This photo is part of the exhibition Lighthouses (February 2010). This photo was the image of the month in May of 2012. This photo was taken with a digital camera.